Overall, homelessness seems to be on the decline in the U.S. 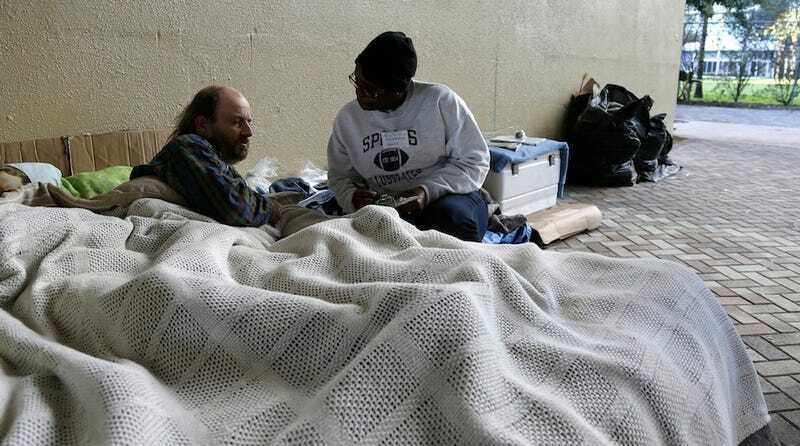 Since 2007, the rate of homelessness for all Americans declined nine percent; however, for about half of the states in the country, homelessness is still getting worse. ThinkProgress compared datasets from the Department of Housing and Urban Development in 2008 and 2013 to see the change in homeless populations across the country. While we hear so much about chronic homeless populations in cities like Los Angeles and Miami, those states actually saw a decline in the homelessness rate. The state that saw the greatest increase in homelessness? North Dakota. The five states seeing the most improvement are well-known for their focus on social services and supportive housing. This includes Colorado, which has been lauded for its impressive homelessness initiatives—especially Denver's Road Home, the city's 10-year plan to end homelessness by 2015. Michigan and Oregon both have similar goals. But it's surprising to see the states where the homeless population has skyrocketed. The states hit hardest by the foreclosure crisis, for example, are not seeing dramatic increases in homelessness. It's midwestern states like North Dakota, South Dakota, Kansas and Montana which are seeing an increase. In North Dakota, where homelessness rose by 234 percent, this is likely due to the overall population boom from the fracking industry, which caused many people to move to the state for this type of work and find that the housing is too expensive to afford. Likewise, the loss of other industries compounded with the housing bubble might have contributed to homelessness in other states. But here's another map, from HUD's 2013 report [PDF], which puts the changes in perspective. In 2013, 50 percent of all homeless Americans lived in five states: California, Florida, New York, Massachusetts, and Texas. So even though the total number of homeless people is going down in California, it still has the largest homeless population in the country. In fact, one fifth of all homeless Americans live in Los Angeles and New York City (where the homeless population surprisingly went up 13 percent last year). There's also an important factor at play here which can cause some nuance in this data. First of all, there's no formalized way to count a homeless population—each city does it differently. Most cities rely on a team of volunteers to do the counting on a single night (or series of nights) and might have changed the way they do their counts, or even who they count as "homeless" (residents who are sheltered vs. living on the streets) during the past five years. This data should be a call to action for the federal government to create a standardized way to measure homelessness across the country. The United States Interagency Council on Homelessness has laid out a plan to end homelessness in the U.S. by 2020, which seems incredibly ambitious after observing these stats. But the council has a second goal to end chronic homelessness for veterans by 2015, and some cities have actually made some great gains here by focusing specifically on this group of homeless Americans and measuring their progress.